The green movement is beneficial both to the environment and to your wallet. There was a time when people did not worry about energy efficiency, but this is not the case today. Modern homeowners are well-informed and aware that eco-friendly homes result in lower heating and cooling bills. Implement the next 7 ideas to help make living spaces more comfortable, while also reducing the cost of your energy bills. A large part of the renewable energy comes from the sun. 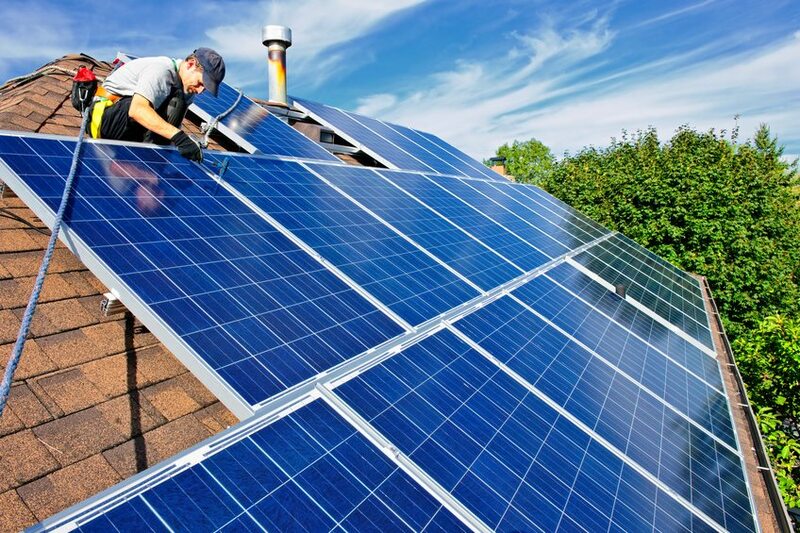 This means that sunlight and solar energy can help with the lighting and heating of the house by generating electricity, heating water and solar cooling. Sun will also drive winds whose energy could be captured with wind turbines. Plus, heat and winds cause water evaporation, which naturally translates into rain or snow that go down the hill into rivers and streams. This energy translates into hydroelectric power. If you plan on going green and reducing energy bills, you should implement some energy conservation arrangements. Heat loss is generated by the temperature difference between the inside and the outside of the house. It is influenced by the heat transfer coefficient of the construction material and the surface area. Heat loss also happens by means of air exchange which translates into the outward movement of warm air and inward movement of cold air. Finally, heat can also be lost as a consequence of the direct emission of infrared energy from inside the house through the covering. When arranging furniture inside the home, keep an eye out for the vents. Avoid blocking vents with large design or decoration items that could damage the airflow. Once you made sure vents are in place and well functioning, make a habit of regularly cleaning them out to improve air movement. Central cooling and heating systems also have filters that need to be changed monthly. Heating and cooling the home could be pricy, but people can easily reduce the energy usage by improving the way they use air vents and curtains. For example, if you live in a multi-story home, your upper vents should be closed during winter because heat will naturally rise from the lower floors. During summer, close your lower floor vents. Cold air goes down, so the process is reversed. This is a small and easy change that will help with the balance of your home temperature and therefore reduce your energy bills. The green movement embraces passive improvements that cut back on heat transfer without requiring any additional energy. For example, dark-tinted windows block sunlight. Despite the fact that heat and sun are usually beneficial, infrared, ultraviolet and visible light rays can affect people’s lives and cause sunburns. These darkened window films can block a significant amount of heat energy, still allow the homeowner to enjoy a natural view. A window tint (solar control film) sometimes has a polyester base and a scratch-resisting coating. Manufacturers use different types of additives for these windows. Some are dyed and absorb the sun’s harmful rays. Others are metalized or use ceramics to reflect the light. Window films come in many shapes and colors, ranging from opaque to clear. Sometimes they have a metallic look, like stainless steel or bronze. Tinted windows offer more privacy, while also being beneficial to your home and energy efficiency. Small habits can sometimes make all the difference. When the weather is cold, open curtains early in the morning to let the natural light and heat in. As temperatures rise, keep curtains closed against the sun and prevent the rooms from warming up too much. Upgrade the interior design by going with two different sets of curtains. Use a thicker fabric in the winter, and switch out to a lightweight material during summer. Adjust the thermostat just a few degrees to keep the energy bills in line. Increasing the temperature by one degree in the summer and lowering an equal amount in the winter can help people save up to three percent on their energy bills. You can also use fans or space heaters to further enhance the temperature in certain areas of the home like your bedroom or bathroom. In North American climates, the southern side of the home tends to warm up drastically in the summer. One way to cool things down is to use an awning or canopy in those areas. Whether it’s a carport for additional parking, a gazebo on the patio, or window awnings, covering up sections on the southern-facing side is an easy way to lower the cost of air conditioning. Plant additional trees around the property to shade the entire house during summer. The sun can still shine through the bare branches to help warm the home. Be sure to put some trees where they will shade the air conditioning compressor for additional savings. An energy audit will take an in-depth look at the entire property to see where the greatest losses are. This is an easy and cost-effective way for homeowners to determine which upgrades will be most beneficial to them. Audits are offered by independent companies, and many utility providers are offering the service for a nominal fee. The green energy movement has been around for a long time now, and it’s becoming a natural part of American life as people strive to protect the environment for future generations. In many cases, homeowners will have to spend money today to make savings down the road. While this might seem inefficient, potential savings far outweigh the initial cost. Building owners and architects can also thank the green movement for tax breaks, including the 179D tax deduction and the 45L tax credit. Eco-friendly homes have now become more costly-efficient. If you plan on upgrading your home or simply building one and you want to meet the energy efficiency criteria, schedule a meeting with one of our specialists and we will offer all the answers and information you need.